Dr. Ashley Abraham attended the University of Delaware for her B.A. 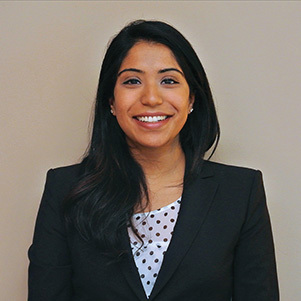 in Spanish Studies, the University of Pennsylvania for her Doctorate of Dental Medicine, and the University of Pennsylvania/Children’s Hospital of Philadelphia for her pediatric dentistry residency, where she served as chief resident. In dental school, Dr. Abraham combined her passions for writing, literacy, and promoting positive oral health habits and attitudes by writing and publishing a children’s board-style book entitled “Brushtime, Bedtime.” During her residency, she cared for wide range of patients including those with medically complex conditions, craniofacial syndromes, and special needs, and developed a true passion in serving these populations. To ensure that her patients receive the most updated dental treatments, Dr. Abraham attends courses held by the American Academy of Pediatric Dentistry (AAPD) and studies the latest journals by the AAPD, the American Dental Association (ADA), and the American Academy of Pediatrics (AAP), as well as current literature in diet and nutrition. Dr. Abraham is a Philadelphia-area native, growing up in Newtown, Pennsylvania. She now lives in Philadelphia. When she’s not working, you can find Dr. Abraham spending time with her friends and family, especially her five-year-old nephew, reading, pouring over food blogs and cookbooks and trying recipes, re-living the Eagles’ Super Bowl championship and following Philadelphia professional sports teams, and honing a beginner’s yoga practice.